Citation Information: J Clin Invest. 2007;117(3):803-811. https://doi.org/10.1172/JCI30142. An essential element of the innate immune response to injury is the capacity to recognize microbial invasion and stimulate production of antimicrobial peptides. We investigated how this process is controlled in the epidermis. Keratinocytes surrounding a wound increased expression of the genes coding for the microbial pattern recognition receptors CD14 and TLR2, complementing an increase in cathelicidin antimicrobial peptide expression. These genes were induced by 1,25(OH)2 vitamin D3 (1,25D3; its active form), suggesting a role for vitamin D3 in this process. How 1,25D3 could participate in the injury response was explained by findings that the levels of CYP27B1, which converts 25OH vitamin D3 (25D3) to active 1,25D3, were increased in wounds and induced in keratinocytes in response to TGF-β1. Blocking the vitamin D receptor, inhibiting CYP27B1, or limiting 25D3 availability prevented TGF-β1 from inducing cathelicidin, CD14, or TLR2 in human keratinocytes, while CYP27B1-deficient mice failed to increase CD14 expression following wounding. The functional consequence of these observations was confirmed by demonstrating that 1,25D3 enabled keratinocytes to recognize microbial components through TLR2 and respond by cathelicidin production. Thus, we demonstrate what we believe to be a previously unexpected role for vitamin D3 in innate immunity, enabling keratinocytes to recognize and respond to microbes and to protect wounds against infection. 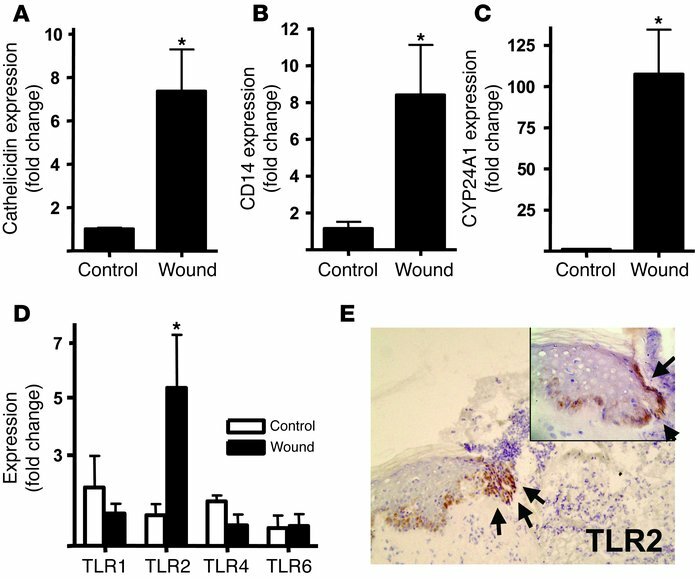 Injury triggers increased TLR2, CD14, and CYP24A1 in skin. Human wounds 24 hours after full-thickness sterile skin incision were evaluated for the expression of innate immune recognition and response molecules (n = 5). Transcript abundance was measured by qPCR, normalized to GAPDH expression, and compared with noninjured skin (n = 4). (A) Wounded skin showed an expected increase in expression of cathelicidin, a vitamin D3–responsive antimicrobial gene. Additional vitamin D3–responsive genes, the TLR co-receptor CD14 (B) and the vitamin D3 catabolic enzyme CYP24A1 (C), also increased after injury. (D) Expression of TLR2 mRNA, but not that of TLR1, TLR4, and TLR6, was increased after injury. (E) A corresponding increase in TLR2 protein staining on keratinocytes at the wound edges was seen (original magnification, ×100). The incision site is marked by black arrows. An enlarged sector is displayed in the inset (original magnification, ×400). *P < 0.05, Mann-Whitney test.